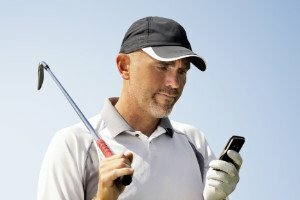 Home » GPS Devices » Are Golf GPS Devices & Rangefinders ‘Legal’ for Tournament Play? Not so long ago, electronics weren’t allowed anywhere near the course on tournament days. A little later on, they were allowed with conditions. Now, it seems there’s even more allowance for golf laser rangefinders and GPS devices to be used in a game. 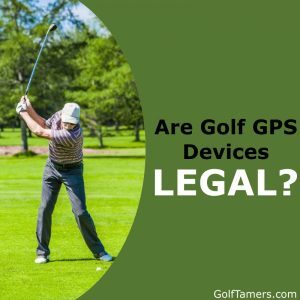 The gist of it is, golf GPS devices are legal for many tournament events. 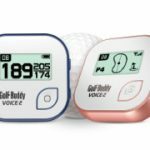 While the revised rule certainly has restrictions, you’re now able to own a feature-loaded GPS device while still having it qualify for tours. But, there’s a catch! Here, we’ll lay out what you need to know about using a GPS device on the course on the big day. It could be the difference between earning that trophy or embarrassingly being kicked out of the game. Rule 14-3 covers “Artificial Devices and Unusual Equipment; Abnormal Use of Equipment.” It basically says that no golf player is to use any device that helps him or her in the game. This enables the skills, judgments, and abilities of each player to be compared without an unfair advantage over another. With that under your belt, you’ll see that no laser rangefinder or GPS device can be used in tournament play. Any use of of such device would be a breach of Rule 14-3. However, Rule 14-3 was revised in 2006 to allow the use of distance-measuring devices. It was again revised in 2016 to allow devices to sport prohibited features as long as they are disabled, turned off, and not accessed during the stipulated game. The Committee of the governing event can institute what they call a “Local Rule.” Local Rule can allow for conforming electronic devices to be used. These are what you would consider laser rangefinders and GPS rangefinders. The GPS devices can be a hand-held one or a watch. These are other devices such as phones or tablets that are designed for general use. However, if it’s possible to download an app or program to use as a distance-measuring device for golf, it’s allowed. What are the Conditions of Using a Distance-Measuring Device? 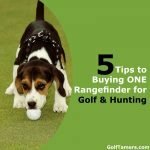 Since you have the go-ahead to use a rangefinder and GPS device, what’s allowed and what’s not? Can share the GPS device among players. Measure and gauge distances to your target. Measure and record distances of shots. Allow for GPS device to have other conforming features (clock, calendar, basic scorecard info). Access to phone, text, emails, and weather. Access to record swing for review after the stipulating round. Here’s the red light for what you can’t do. If a Course allows for GPS Devices to be used, will it be allowed for a Tournament Event it’s hosting? The Committee’s rules and policies for the event always supersede what the course allows on a day-to-day basis. If they allow for Local Rule to include GPS devices, it’s allowed. Are all Conforming Distance-Measuring Devices Legal? You might think so, but until it’s been reviewed by the USGA, it remains a device that’s a breach to Rule 14-3. Manufacturers must submit a product for review and await ruling before it can be considered legal for tournament play. When did the USGA Change their Stance on the use of Distance-Measuring Devices? In 2016, the USGA revised the rule to allow for devices to include prohibited features as long as they were turned off and not in use during the stipulated round. What Devices are now Considered Legal with the Revised Rule? The Garmin Approach G8 was previously prohibited from use in tournament play because of their extra features. However, with the revised rule, their extra features can be turned off and allowed with Local Rule. Do all Tournaments Utilize Local Rule? Where can I find more Information to the Revised Rule? You can find everything you need to know on the USGA website. For a quick trip, you can find Rule 14-3, the revised rule (Article IV-5), Rules and Penalties for Rule 14-3, and frequently asked questions about distance-measuring devices all right here. What does “Actively measure and gauge weather conditions with built-in feature” mean? It means that you can’t use a built-in feature on your device to measure the weather or any condition actively or instantly that helps your play. However, you can use a third party feature such as a web browser or app on a hand-held device that allows access to active weather. There’s been a lot of lee-way to allowing distance-measuring devices, especially pimped-out GPS units, on the course. The honor code is evermore applicable when it comes to using them. If you don’t have an honest bone in you, you’ll be caught for sure! The legal and prohibited aspects of Rule 14-3 and its revisions are still a little murky. While a lot of clarification has been offered, it’s always better to check what the rules are for each event before you assume Local Rule is in effect. It’s better to be safe than sorry!